Mainly involved with the ferry boat business in the Mackinac area of Michigan, Union Terminal Piers, Inc. ventured into the ski industry in the late 1970s. On July 29, 1977, Charlemont Enterprises, Inc., a bank holding company, sold Berkshire East, MA to Union Terminal Piers' subsidiary Berkshire East Recreation, Inc. Roy Schaefer, President of Berkshire East Recreation, Inc., had previously operated the ski area for the Robert J. Narkis (The Banking Center, then Centerbank, then First Union Bank of Connecticut) during the 1976-77 ski season. In conjunction with the Berkshire East acquisition, two other nearby properties were briefly owned and operated - a gas station in Charlemont and the Oxbow Resort Motel. On October 21, 1977, a subsidiary of Union Terminal Piers agreed to purchase Cannonsburg ski area in Michigan from Bill Goff and partners for $2.5 million. Located just outside of Grand Rapids, Michigan, Cannonsburg was a small, but popular ski area. The company assumed control of the ski area on March 1, 1978. 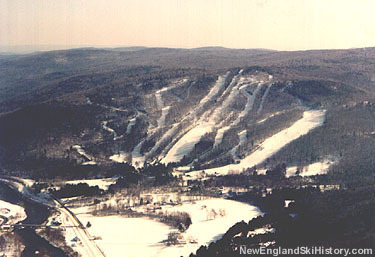 The management of Berkshire East also operated Berkshire Snow Basin ski area in Cummington, MA, for the winters of 1980-81 and 1981-82. On July 10, 2007, Union Terminal Piers, Inc. sold Berkshire East to the Schaefer family's Berkshire East Ski Resort LLC. On June 21, 2010, Union Terminal Piers, Inc. and its remaining ski area, Cannonsburg, were sold to a group of investors led by attorney James Wynn of Petosky, Michigan.